Erika Benfield born in Puerto Rico to parents Yvonne and Ed Oliveras moved stateside at age six. Founder of Florida Living Quarters Interior Design firm and retail showroom. Since the opening of business 2008, Florida Living Quarters has received nominations and awards from local chambers of commerce and Orlando Business Journal as Top 10 Interior Design Firms. Civic volunteer work includes, Past President of Toastmasters Lake Mary, Rotary Clubs, and lay leadership of Lakeside Fellowship Methodist Church. Currently Rotary club member of DeBary, Deltona, Orange City president elect 2019-2020. Volusia County has been Erika’s home for six years with her husband Paul and family. Mother of four kids, grandmother to one, two horses and a German Shepherd. She has planted roots in Volusia County. Currently serving public office as the first minority Hispanic woman Vice Mayor of DeBary having won at large seat 2 by largest voter turnout in DeBary history. Raised in White Plains, New York, moved with my husband’s company to Chicago in 2001, and then to Florida in 2009. I am busy wife and mother, but I always find time to be involved. Being an active volunteer in the community has been my passion for many years, and being elected to the DeBary City Council was the cherry on top. Being self-employed as an Independent Representative with Tupperware Brands has rewarded me with the time to coordinate and attend activities throughout the city and the county. I hope that my skills and knowledge will be an asset to the community and to the City of DeBary as a Council Member. Larry Drumb's wife of 29 years is Emily. He has 3 children, Kyle, Zak and Taryn Drumb. Larry Drumb is self-employed as a swimming pool contractor. His hobbies include: volunteering, President of the East Central Chapter of the Florida Swimming Pool Association, President Elect, Rotary club of Deland and Deland Elks. He enjoys woodworking, dining out and traveling. Originally, from The Bronx New York, Yvette has lived in West Volusia for 30 years, and currently resides in DeLand. Prior to joining the team at United Way, she spent 20 years in hotel management, event planning, sales, and marketing. Yvette now works as a Resource Development Manager at the United Way of Volusia & Flagler Counties, building relationships while developing resources for United Way partners and our community. Yvette’s previous community involvement includes holding board and executive board seats with the DeLand Chamber of Commerce, the DeLand Mainstreet Association, and the DeLand economic development committee. She currently sits on a number of VMA committees, serves as an Ambassador for the Daytona Regional Chamber. Founded and Chairs the Deland Chamber’s Women Empowered initiative. Also nominated Hispanic Community Leader of the year by the Volusia Hispanic Chamber. Born in Jersey City, New Jersey and raised in Central Florida. Desireé attended Southerwestern 7th Grade Center, DeLand Middle, DeLand High School and graduated from the University of Central Florida with a degree in Anthropology. Desireé’s professional background is mostly in Higher Education, specifically in Faculty support and student teacher matriculation. Currently, Desireé is the Events & Promotions Coordinator for MainStreet DeLand Association, the local Florida MainStreet Program accredited nonprofit organization with historic preservation roots. Glysobel “Bella” Fuentes is an experienced Branch Vice President with a demonstrated history of working in the financial industry. With over 18 years experience in the banking field, Bella moved to Deltona Florida from the Chicago market 7 years ago and has served Volusia County since. Bella was selected by VyStar Credit Union to lead their efforts in building relationships in DeLand and West Volusia communities. Bella graduated from DeVry University with a Bachelor’s degree in Business Administration with a minor in Human Resource Management. She is currently working with her employees on their objectives in assisting their credit union members and local communities with their financial needs. 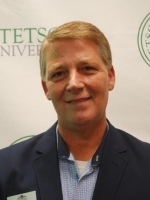 As AVP for Marketing Communications at Stetson University, Janie oversees the work of the Communications office including media relations, social media, Stetson Today, Stetson University Magazine, internal communications and web editing. In addition, she oversees the Events office. As AVP, Janie is responsible for increasing visibility of Stetson and enhancing the university's image by publicizing people and programs that best illustrate the Stetson brand. In addition to Communications and Events, she serves on the university's Emergency Management Team, providing communications counsel and guiding emergency communications. Janie also serves on the university’s Environmental Working Group. Janie earned a Master of Journalism and a Bachelor of Arts from Louisiana State University. Prior to Stetson, she worked at the AAA national office in Heathrow, Florida, in social media and public relations. While there, she launched AAA's social media sites on Facebook, Twitter, YouTube, Google+, Instagram and other social media outlets. Janie was a national spokesperson for AAA and won a Silver Anvil from the Public Relations Society of America (PRSA) for her work there. Before joining AAA, Janie was a reporter and editor for newspapers and magazines and wrote frequently about travel and golf. Taylor Gunderson is an Apprentice Electrician at Calkins Electric in Deland Florida who is also enrolled in the Electrical Apprenticeship program at Daytona State through the Advanced Technology Center. Taylor has learned a vast array of knowledge and skills related to the Electrical Industry and plans to become a local Electrical Contractor in West Volusia. The skills and knowledge he has gained are the footsteps to learning how to make electricity easier to produce, transmit more efficiently, and ultimately make it more affordable for all people. Taylor also has some experience in variants of low-voltage systems, these systems include fiber optics, networking,cameras, fire alarm and security. Taylor lives by the saying “You can do anything you want, just put your mind to it.” Taylor started pole vaulting in 2009 and in 2011 he broke a 37 year old pole vaulting record at Deland High School during the state track meet. Taylor has a Bachelors of Arts in Art with a focus in Ceramics from Stetson University of Deland Florida. Marnie Harris is the Emergency Department Nurse Manager for AdventHealth Fish Memorial. She is a graduate from the University of Central Florida with a Bachelors of Science in Sports and Fitness. Nursing is a second career and she earned her degree from Rasmussen College. As a new nurse she won the Nightingale Award for Excellence in Nursing. Outside of the hospital she teaches indoor cycling classes.